The AvengerF831 Baby Female Swivel with Ball can convert an arm or dowel up to 5/8" in diameter into a boom arm. It can add versatility to your non-swiveling light fixture (with optional #013) to make it more versatile. Each end has a locking Baby 5/8" (16mm) receiver. 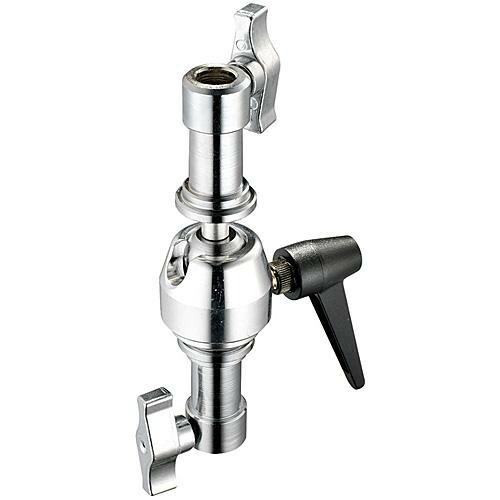 The ball joint has a pull-and-lock aluminum alloy handle with anti-rotation springs. It weighs 1.76 lb (0.8 kg). Box Dimensions (LxWxH) 7.5 x 7.35 x 3.1"
F831 Baby Female Swivel with Ball is rated 4.5 out of 5 by 2. Rated 4 out of 5 by Ernesto from Great studio device, useful accessory. This is the Avenger version of the magic finger, very good value, heavy chunk of metal. The ratcheting main handle usefull for getting it to the best location for final tighten down or release, something that I'll be looking for in all my future grips. Double female version is the best one to have, even though it cost more then the male/female version. 90 degree slot very useful. Machine groves on ball does become apparent under load, not sure Matthews version has it or not. Rated 5 out of 5 by Matt from Solid as a rock This is one solid piece of equipment. Beautifully crafted. It’s rated at 28 lbs but I wouldn’t be surprised if it will firmly hold a lot more than that. So far it’s allowed me to hold 15-20lb products and reposition them without loosening and retightening. Does this fit common light stand stud/spigot or is this for C-stand stud ? Asked by: Nixon Glenn M.
This fits a 16mm stud, which is what a C-stand has, as well as any baby stand with a 16mm stud.